Ed Kilner swung through Montreal on his way to a grand tour of the Maritimes, and spent a night with us. 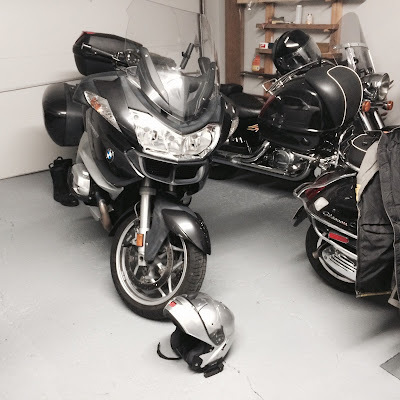 I made room in the garage for his BMW R1200RT. 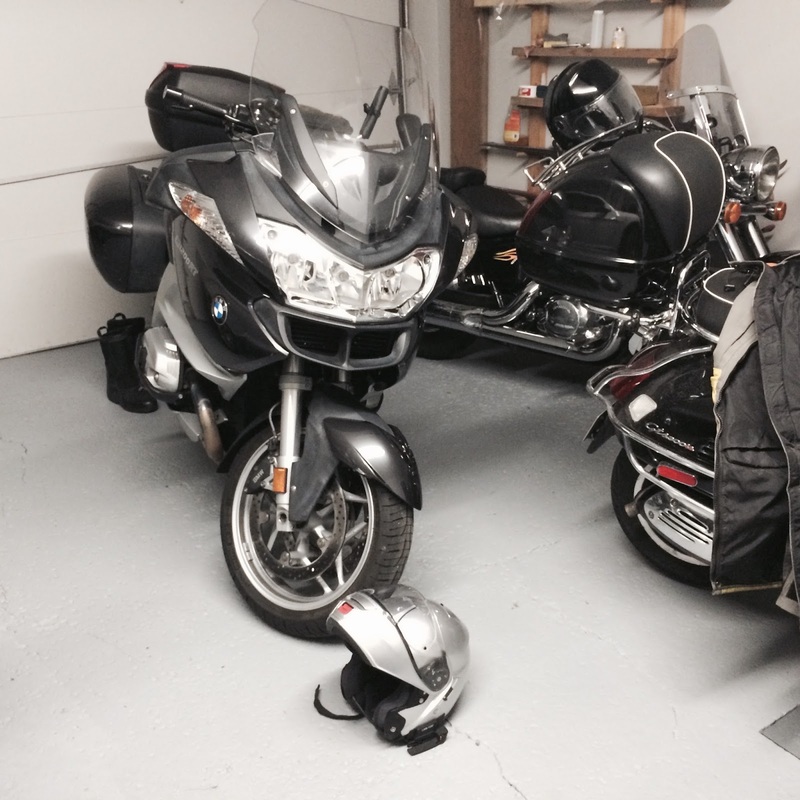 It was the second time there were two Beemers and three bikes in the Masse garage. We caught up on a bunch of topics including all types of things we discovered we had in common professionnally that you would never suspect. Mostly boring change management stuff and the role of information technologies, or at least boring to most people, but endlessly fascinating to Ed and I.
I barbequed some steaks, Susan made a salad, and I cooked some market fresh new potatoes, all of which went nicely with an organic cabernet sauvigon blend. Ed was up at the crack of dawn gearing up for a ride up to the Gaspé. 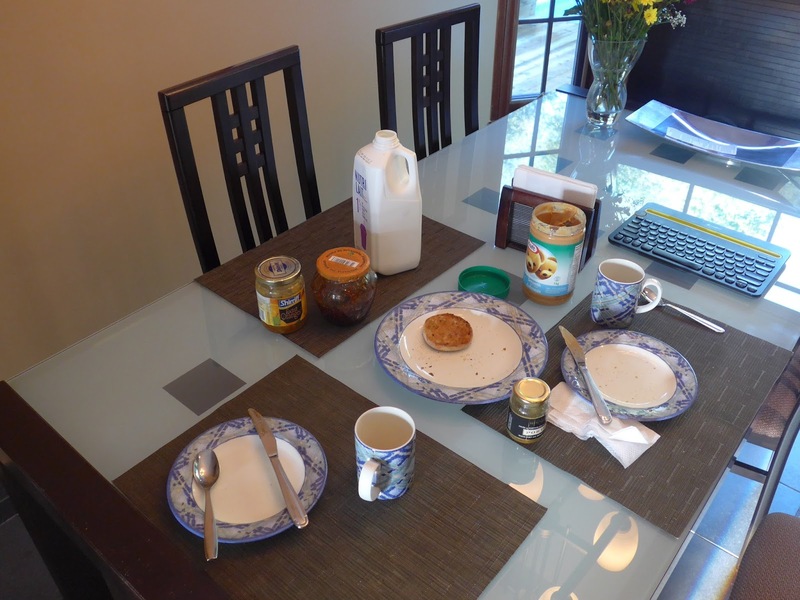 At Ed's suggestion I threw a modest breakfast together. 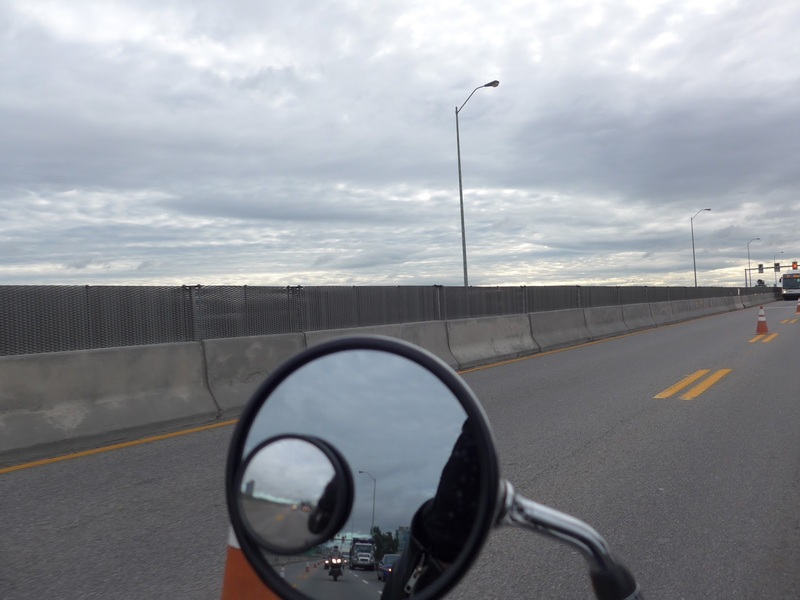 Ed asked for the best route to take to the south shore route to Quebec City. 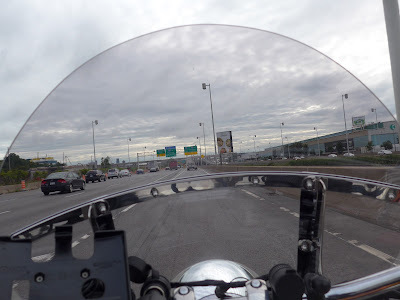 It took me fifteen seconds to let Susan know that I was going to ride with Ed to the South Shore via the Champlain bridge. The ride was uneventful, though the morning rush hour was in high gear. 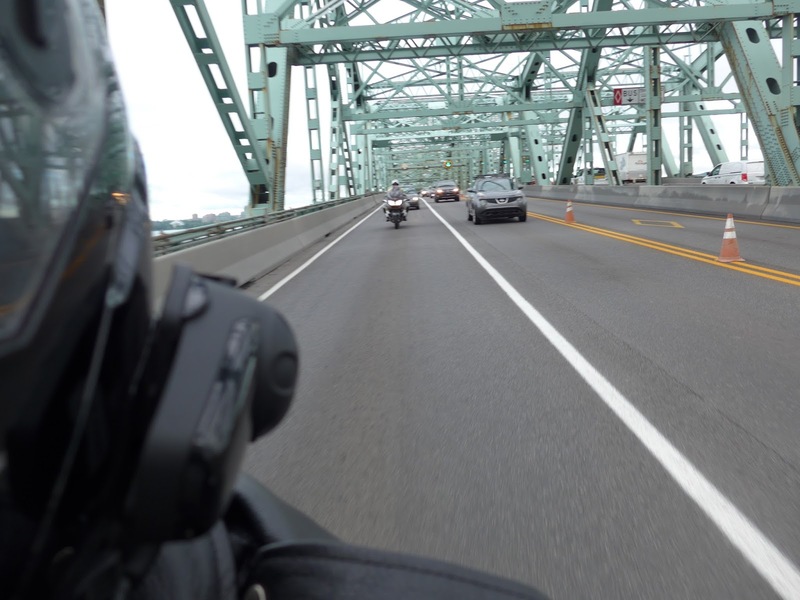 Fortunately the route I took was flowing nicely and we made it over the bridge and off the island in very good time. 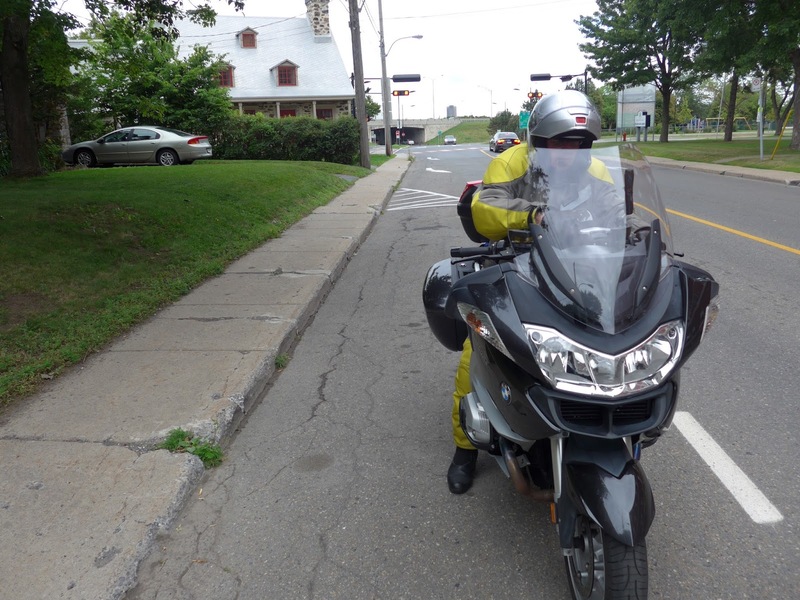 We pulled off route 132 on the South Shore, onto a side street in Longueuil where Ed programmed his GPS for the road to the Gaspé Peninsula. We said our goodbyes, I wished Ed safe travels, made a U-turn, honked a goodbye blast of Thunderbird's air horn, and headed back home. Around supper time Ed sent me an e-mail message saying that he had arrrived safely in Rimouski. You can read about that leg of his travels here. 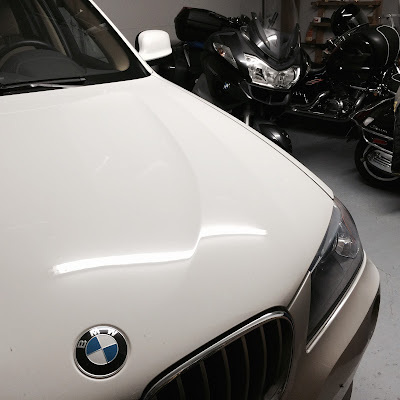 PS: Ed's Beemer cracked its oil pan on a misplaced brick, ending his Maritime tour, and ending his Beemer too. 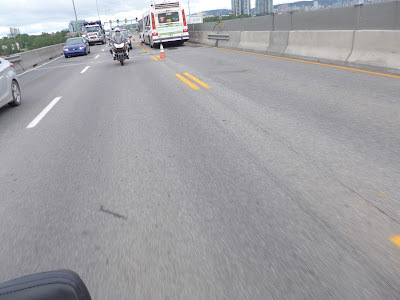 Ed's fine, back home, but for the time being, bikeless. Read all about it. After reading about Ed's journey I am both, excited and a bit anxious about my trip. Glad you hit it off with Ed. I now very much appreciate the 30 bypass so I don't have to do high traffic bridges or tunnels heading east. Hopefully one day I will meet more of my blogging buddies! David, a fortunate for all overnight visit. Thanks much for the link back to the last time there was 3! A bloggers home is always a welcome sight after a long day's ride. Nice meetup. Did you change the exhaust on the Shadow yet or decide to live with it? Such a good time, you guys! Some day we blog buds will all ride together...maybe a camp out and sit around the fire late at night and trade stories and laughs. David, I am home now, sans my R1200RT which will be declared a total loss. Lesson: don't run over bricks or rocks which can hole the engine causing loss of oil causing engine to be destroyed. And, front rim and tire too. Looking into the new models... . Life goes on. But the real reason for my comment is to thank you and your wife for making me welcome. I enjoyed my visit thoroughly. 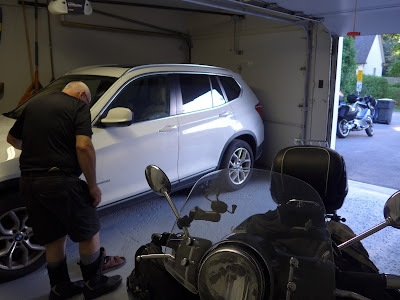 Sonja, if it makes you feel any better, when I was getting ready to leave the dealer after the Honda's service, one of the mechanics walked by and said "Ah, a Honda Shadow... indestructible!" I had dropped in on Ed at his home for coffee on my way to meet you in State College a few years back. The 30 bypass is a really useful ring road that avoids the whole highway 40 elevated section through the middle of the island. Much faster and less traffic. You never know when our paths may cross. Thanks Doug. Who knows... I'd be thrilled to host one of your many bikes. It's a little bit of a ride though. Brandy that is so true. Richard that's a funny thing. I did change the exhaust, and you know what? The OEM exhaust sounds way better than the Cobra pipes. Much deeper exhaust note, plus the bike has less vibration, and the engine's happier too, only very minor backfiring on compression now. I honestly don't know why anyone would want to spend money on those pipes. Deb, I would love nothing more. Ed, you're welcome here any time! I am curious to see which bike you will choose.